The welcome email is an important piece of communication, an opportunity to introduce yourself to your subscriber or customer for the very first time. You need to make a good first impression to avoid getting deleted upon opening, or worse, sent to the spam folder. If somebody just signed up for your email newsletter or placed an order, they’ve taken a leap of faith to share personal information or buy something from you. Make sure your welcome email thanks them graciously for their interaction and even consider giving them a thank you gift, such as discount coupon for a future order or a free download, just for joining the list. Virgin America does a good job of welcoming new subscribers with a simple ‘thank you’ message and providing a link to the best fares in case someone wants to explore options. You can use any CTA that encourages some type of interaction as a way to open up the line of communication with the new subscriber. While addressing the recipient by first name is no longer exciting, dynamically populating the email with data the recipient is interested in is! Make your welcome email as personalized as possible. If you own a shopping or retail website, the email might include a few items from the online catalog the recipient was browsing when they last visited the site. If you own a business service website, your email might include more details about a package the recipient placed in their cart or recommendations on what they might like based on their visit history. The point is to create a customized experience so the recipient feels acknowledged and understood. 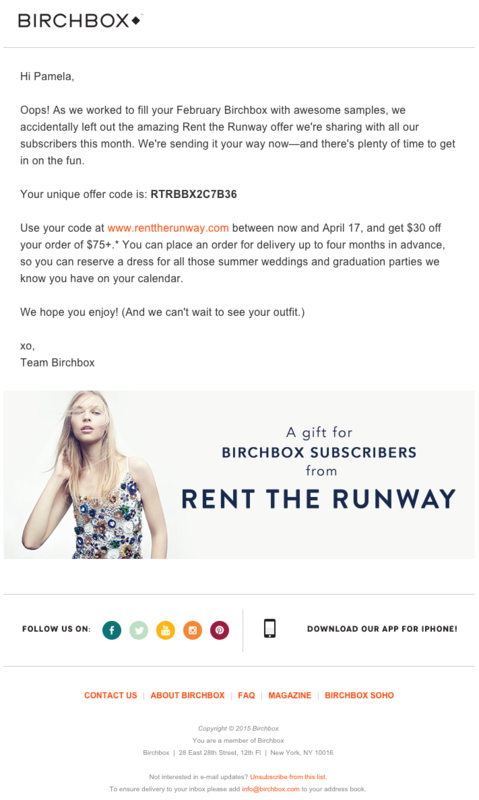 Birchbox, a company that sends out beauty subscription boxes each month, did a great job with this as part of their co-marketing efforts with Rent the Runway, a dress rental company. All subscribers received an email with the subject line, “We Forgot Something in Your February Box!” which was actually an email about a discount code available for a limited time for Rent the Runway. Doing something like this in a welcome email may seem a bit risky, but with great risk comes great reward! It is a simple and effective way to not only ensure the email is opened, but also provide something of value to new subscribers. In addition to thanking the recipient for joining the list, you can give them a quick refresher of what you offer and what’s in store. This can help to keep the recipient engaged and hungry for more — decreasing the risk that your email will end up in the trash or the spam folder after reading it. Consider that the average email recipient will be exposed to dozens or hundreds of emails throughout the day. You want your message to stand out by highlighting some benefits of being on the list and sharing a preview of what’s to come. The only way your recipient is going to see the welcome email message is if they choose to open the email in the first place. Your subject line needs to encourage an instant open so you don’t get lost in the shuffle of emails or get deleted immediately. You want to catch your recipient’s attention in the seas of emails they get on a daily basis, but a welcome email may not require anything more than a ‘Thanks for signing up! Here’s what’s in store…’ or similar. You want to create some intrigue and incentive for opening the email and also remind the recipient that they are now on the list. Your welcome email is an important part of your communications strategy and needs to have certain characteristics in order to be delivered successfully. Use these tips to design and launch a successful welcome email campaign to improve subscriber retention or even prompt a sale.